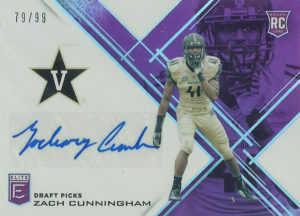 Zach Cunningham played for the Vanderbilt Commodores from 2014-2016. As the doormat of SEC football, Vanderbilt is not known for its football bloodlines, but Cunningham impressed in his time at the school. With a strong motor, the uncanny ability to always be around the play, and the speed to cover runningbacks and tight ends, Zach recorded 256 total tackles (156 solo/ 100 assists), 36 tackles for loss, 6 sacks, 6 passes defended, and 6 forced fumbles over 3 years. Zach lasted well into the second round of the 2017 NFL draft where he was selected by the Houston Texans. The Texans were drafting based on best available player, and draft pundits considered this selection a steal. Since there was a bevvy of activity on EBay for both the Texans first round pick (Watson) and 3rd round pick (Foreman) at blown up prices, I thought I’d see what the market was dictating for Zach’s rookie card. I really liked the design of this card and sniped out the card at an incredibly cheap price. Zach finished his rookie NFL season in impressive fashion. Playing in all 16 games he had 90 combined tackles, 1.5 sacks, and 6 pass deflections.